The requirements that modern production places on a sensible air-conditioning concept for industrial building are wide-ranging. They centre on precisely defined conditions such as temperature, humidity or room air quality. Also crucial are of course financial factors such as investment and operating costs and the economic efficiency of the facilities. 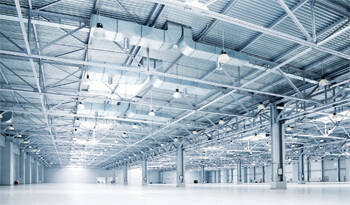 There is practically no other building type that has such varied uses as industral buildings. For production, storage, logistics or a mixture of these: controlled air-conditioning is essential for many types of use. On the one hand, this is the only way to ensure consistent production conditions for obtaining optimum results or meeting specific requirements with an individualised room flow concept. On the other hand, improvement of the air quality in production facilities is mandatory in many cases due to current statutory requirements. For the economic efficiency of a facility, it is above all the operating costs which are crucial besides the investment costs. This is where it is worthwhile making an effort to devise an individualised concept that optimises energy efficiency, durability and ease of maintenance, and hence the energy and maintenance costs too. LTG offers components for ventilation and air-conditioning systems and for production-related processes that can be individually adapted to project-specific requirements: high-performance LTG air diffusers, compact and efficient air/water systems or precise components for air distribution. If necessary, work on the concept can also be supported by LTG’s engineering services with simulations or laboratory tests. For air technology solutions in production-related processes we also offer effective LTG fans and LTG filtration and humidification systems. LTG air diffusers: Industrial displacement air diffusers of the series DLD or DLQ, especially for high air capacities yet high comfort when heating and cooling with high flexibility for installation (depending on type, suitable for use close to the ground or up to 36.5 feet level), highly inductive linear diffusers LDB (with LTG System clean®) and special diffusers. LTG air-water systems: effective fan coil units LTG FanPower for ceiling, sill and floor installation VFC, VKB/SKB (with LTG SystemDesign). LTG air distribution: high-precision round and angled flow rate controllers. LTG fans: Axial, centrifugal and tangential fans for conveying air and substances. LTG filtration and humidification systems: Filtration systems for fibre and dust separation and for recovering valuable materials, and fine-atomising and water-saving air and product humidifiers for ensuring a defined humidity. LTG Engineering Services: Concept work, simulation calculations and laboratory tests based on specific requirement.